It’s all systems go for the Southern African Development Community (SADC)/Russia military and technical co-operation agreement, with a high level meeting in Moscow late last month to discuss an implementation roadmap. 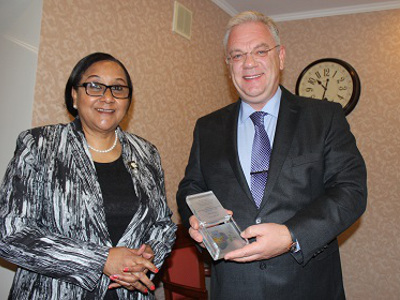 The meeting was held between SADC executive secretary Dr Stergomena Tax and Dmitry Shugaev, who heads up the Russian Federal Agency for Military and Technical Co-operation. It followed the signing of the memorandum of understanding between Vladimir Putin’s Russian Federation and the 16 nation-strong southern African regional bloc in July. According to SADC News, the Russian Federation has constituted a technical working group to discuss and finalise the co-operation roadmap with “relevant SADC structures”. The technical group will be headed by Anatoly Punchuk, deputy director general of the agency. He is reported as saying the Russian Federation would be guided by the principles of the SADC Organ on Politics, Defence and Security Co-operation and was ready to support the regional bloc in building capacity through technology transfer and training. Tax said the southern African regional community would benefit “a lot from the high technological and technical capacity and advanced security systems of the Russian Federation”. This would enable SADC to effectively participate in and contribute to the maintenance of regional and international peace and security, the main thrust of the SADC/Russia MoU on Military and Technical Co-operation. The roadmap will be finalised by a team made up of SADC and Russian experts and officials. In September SADC said it had been given “support” from China for construction of a regional logistics depot in Botswana for the regional standby force. The depot is part of the SADC Standby Force to support regional peace operations under the African Union Standby Force Policy Framework. It will facilitate storage of material, equipment and end-user stocks to ensure readily available logistics support when needed. The aim is to provide stocks on a “just in time” basis to meet the rapid deployment capability of the SADC standby force to support regional peace operations.